Outdoor exercisers are becoming a new trend in the world of training with weights. Such sports dire.. 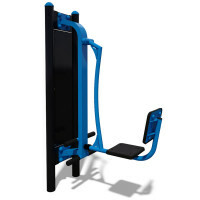 Outdoor trainer for abdominal muscles.The equipment is based on advanced technologies in exercise m.. The air walker simulates a walking or jogging motion with pedals that travel in a smooth, arched pat.. Outdoor exercise equipment reveals a new direction in working out with weights for people of diffe.. Exercise equipment for outdoor activities opens a new direction in occupations with weights for peop.. Outdoor exercise equipment reveals a new direction in working out with weights for people of differ.. Trains and develops shoulders, abdominal muscles, bust and back muscles. Fixes posture and improves ..
Pendulum trains the muscles inside of the thighs, known as the adductor muscles including: the longu..
Trainer Hyperextension trains back, buttocks and hip joints.Characteristics:Length: 1129 mmWidth: 65..